At Maui High, opportunities for boys and girls were different. Classes in secretarial skills, home economics, mechanics shop, woodworking and agriculture all set gender roles along then-accepted employment lines. Patsy did her best to challenge those expected roles by taking a class in physics, where she was one of only two female students, and by serving in student government as Student Body President in 1944. She was learning that she could challenge traditional roles, and that her voice could inspire others to do more and become more. As the girls in her class went off to work and college, Patsy’s goal was to become a doctor – but her dreams were frustrated when her applications to medical schools were turned down because of her gender. Determined to achieve, she pursued a law degree, graduating from the University of Chicago and soon entered a lifetime career as a state and national legislator, championing equality of opportunity for all. In the Territorial Legislature and in the U.S. House of Representatives, Patsy Mink dedicated herself to ensuring that limitations placed upon her generation would be erased. Her career spanned forty years and encompassed significant legislation that has touched the lives of many. 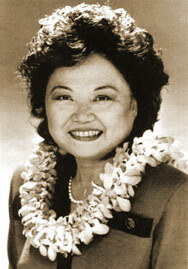 She is best known as a leading voice for women’s rights, who fought for passage of Title IX of the Educational Amendments of 1972 – now known as the Patsy T. Mink Equal Opportunity in Education Act – which opened doors to women’s academic and athletic achievements while also redefining opportunities for future generations of women. The legacy of Patsy Takemoto Mink will long endure in the laws she authored and the causes that she championed. She will be remembered for opening doors of opportunity, providing hope and overcoming challenges for the disadvantaged. Her life was shaped during those memorable years at Old Maui High School, by classmates and teachers, who recognized that she was “a real credit to our school”, and was destined to make a difference. In continuing her legacy through the Friends’ proposed Patsy T. Mink Center, we hope to continue the inspiration and accomplishment of the school’s most famous graduate – the girl from Pa‘ia who learned that she could make a difference.